Surprise! Bacterial Antibiotic Resistance is Not Evolving! A number of recent studies have revealed conclusive evidence that antibiotic resistance in bacteria exists naturally, predating modern antibiotic development and use. Antibiotics have been used agriculturally and clinically for about 70 years. The fact that antibiotic resistance has been discovered in specimens predating human use discredits the long held idea that bacterial antibiotic resistance is an example of “evolution in action”. This would presume that bacteria were evolving on the fly when exposed to antibiotics, developing mechanisms of resistance de novo. In reality, these mechanisms were already in place eons before antibiotics were even developed and used in agriculture, veterinary medicine, or human medicine. Instead, this is an example of natural selection. Bacteria which possess the genetic mechanisms of resistance survive when exposed to antibiotics. As these bacteria survive and reproduce, other bacteria die off. While it may appear that the bacteria have evolved, there is actually no new genetic information in place that was not already there. Of special significance was the discovery of the vancomycin resistance. While most forms of resistance are attributed to a single gene, vancomycin resistance results from a 3 gene mechanism, vanHAX. Extensive analysis determined that the vanHAX genes present in the ancient samples encode enzymes capable of genuine antibiotic resistance. The work of the authors of this study firmly establishes that antibiotic resistance genes predate the use of antibiotics. Furthermore, this study is the first direct evidence that antibiotic resistance is an ancient, naturally occurring phenomenon widespread in the environment. The authors went on to state that new antibiotics will select for pre-existing resistance genes that have been circulating within the microbial genetic code for millennia. Another research article published on 4/11/2012 in PLoS ONE by Keirandeep Bhullar et al (PLoS ONE 7(4): e34953. doi:10.1371/journal.pone.0034953) also demonstrated extensive antibiotic resistance in cave bacteria reportedly isolated for over 4 million years, according to the researchers. 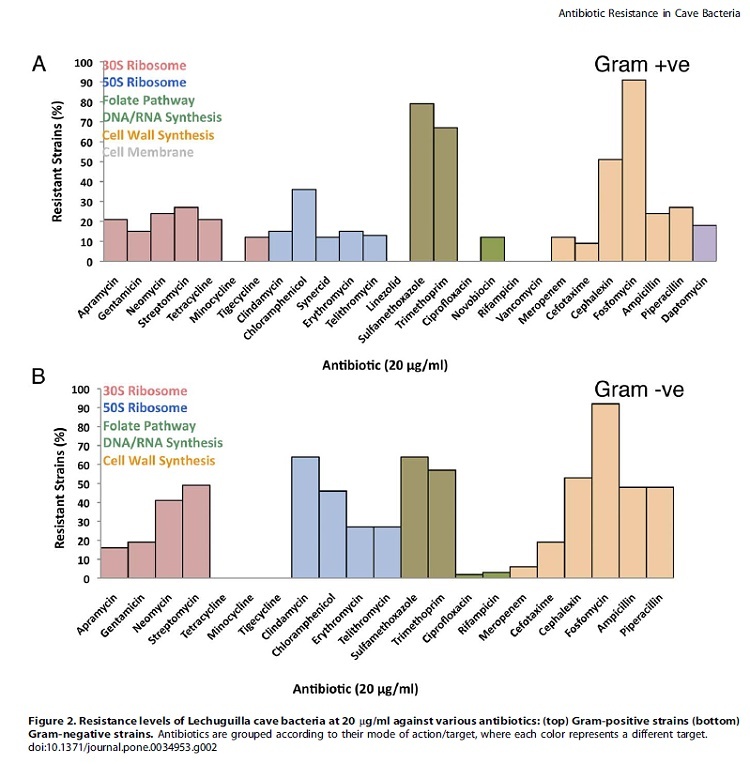 The article was titled “Antibiotic Resistance is Prevalent in an Isolated Cave Microbiome”. In this study, actual living bacteria were retrieved and cultured, looking for evidence of antibiotic resistance. In reviewing previously reported studies indicating that the existence of antibiotic resistance is ancient and independent of human involvement, the authors summarize, “These studies support a hypothesis that resistance is an ancient and genetically rich natural phenomenon, deeply embedded in the microbial genome”. Thus, the resistance is not recently evolved, but already present in the bacteria. The authors of the study were able to obtain bacterial samples from the Lechuguilla Cave, located within the Carlsbad Caverns National Park. Because of the unique process by which this cave developed, it is believed to have been isolated from surface input for the past “4-7 million years”. 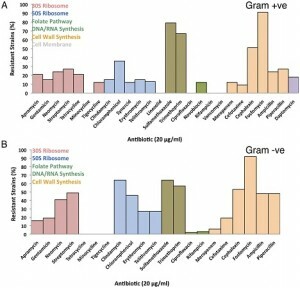 As can be seen from these graphs, the bacteria possessed resistance to a wide variety of modern antibiotics, some naturally occurring and some synthetic or semi-synthetic. There was a wide variety of mechanisms of resistance. Some antibiotics are naturally occurring, often produced by the soil bacteria actinomycetes, or by the fungus Penicillium chrysogenum in the case of penicillins, or by the mold Cephalosporium in the case of cephalosporins. However, many modifications have been made chemically to these antibiotics by the pharmaceutical industry, yet the bacteria still have resistance to these modifications. Why would bacteria possess complex genetic mechanisms of antibiotic resistance when the antibiotics had not yet been created? In the cases of naturally occurring antibiotics, the amounts of the chemicals in the environment are extremely low compared to the concentrations that are used by humans today. Yet, the mechanisms of resistance already exist, predating human use and modification. Bacteria also possess interesting mechanisms of lateral gene transfer and plasmid transfer between each other. Nevertheless, these mechanisms are also preexisting – no new genetic information is being created and no new information is evolving, is spite of the tremendously increased exposure of bacteria to human administered antibiotics. Also, another interesting finding is that the actual genes conveying antibiotic resistance in ancient bacteria are the same genes found in modern bacteria without meaningful changes. Given the extremely short reproductive life span (cell division between 30 minutes and 3 hours) and the tremendous numbers of bacteria in the environment, the opportunity for “evolution” of these mechanisms would have been ideal. However, the genetic mechanisms present in ancient bacteria remain virtually unchanged today. In summary, bacterial antibiotic resistance is pre-existing in ancient bacteria and is not evolving. The widespread use of antibiotics by humans (the anthropogenic influence) has led to an increase in the prevalence of antibiotic resistance through natural selection, but not in new mechanisms of resistance. Bible Verse Collection Update: 56 Verses Added! © 2015 NotAccidental.com. All Rights Reserved. Design by UBD.